Star Wars Force Awakens vinyl comes with floating holograms | What Hi-Fi? 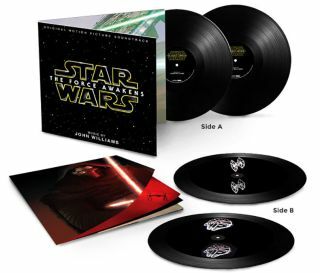 Walt Disney records has announced the Star Wars: The Force Awakens soundtrack will be released on double 180-gram vinyl on 17th June, and will come complete with 3D holograms. Yes, holograms. Holographic images of the Millennium Falcon and a TIE Fighter have been hand-etched into the B-sides of both records by Tristan Duke, who has also performed holographic wizardy on Jack White's Lazaretto album. To view the images, you'll need to be looking from the right angle and have the right light - Disney suggests you use the LED flash on your smartphone. You'll then be able to see the ships, which will appear to float above the record surface. The double LP set also comes with liner notes by director J.J. Abrams and a 16-page booklet. It is available to pre-order now for $50. Sony Classical released the soundtracks to the first six movies across three "Ultimate" editions in September 2015, including a vinyl edition and high-resolution download edition.